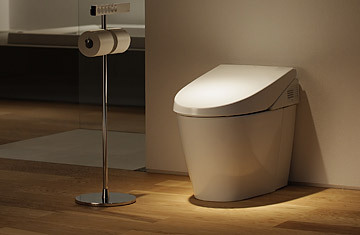 Presciently, the high-end Japanese bathroom-fixtures manufacturer Toto chose a time when the economy is circling the drain to launch its newest product  a $5,000 commode with a super-efficient flush. The Neorest 550 seems at first a senseless money tank, but at a swellegant downtown New York City launch party last week, the press and interested parties were almost persuaded that this fixture is more than a very dear john  if used right, it's good for the environment and it could even save you money. How? Consider the following. You'll save on toilet paper. Go ahead, toss the tissue. You're not getting your hands anywhere near your netherlands. The Neorest does it all for you: It offers a squirt of water in the rear, a squirt of water in the front, a squirt of water that pulses or a gentler stream for tough days. You can adjust pressure and direction from the comfort of your seat. Then there's a down under blow drier. No wonder the manufacturers prefer the term "Integrated Personal Cleansing System" to toilet. Or latrine. Or, you know, thunderbox. You'll save on light bulbs. Not only will the Neorest 550's self-opening and closing toilet lid have you wondering how you ever managed without it, the heated seat comes with a cheerful built-in night light. Nothing says welcome quite like a friend that rises to greet you, offers a beacon to guide the way and a warm reception once you arrive. Comfort station, indeed. You'll save on air-freshener. The Neorest 550, the brochure states, has a built-in catalytic deodorizer that neutralizes bad ions through a filter, thus reducing stinkage. I can't tell you if this works. Although I tried out most of the features of the Neorest at the launch, there was a line of people waiting to use it after me, so I declined to put this technology to the test. Sorry, my journalistic rigor only goes so far. You'll save on therapy. Previous Neorests have come with a device that imitates the sound of water flushing  presumably to disguise any other sounds emanating from the bathroom. But the newer model has a sound system that accommodates an SD memory card, and comes preprogrammed with 18 soundscapes. Some of them  the pounding of the ocean, the Lite FM jazz  appear to be designed to promote meditation. Others  classical music, running water, classical music played over running water  appear to be inspirational. Still others  there's a sort of marching tune in there  are more of the get-on-with-it variety. At least one customer was converted. "It's a brilliant design," said engineer Gerry Brinker, who plans to buy one or two for his suburban New York home. "Of course, my wife's worried about it. Between that and the iPod, she thinks she'll never see me." Pearl Brinker patted his arm. "It's all right," she said indulgently. "I'm going to get them to put in an ejector seat."